One year ago this week it was Chris and I running around the streets of Cairo, getting a crash course in revolution from some of the most passionate, charming, and welcoming people one could ever have the good fortune of meeting in this life. From our home base in western feeling Zamalek, to our front office between the hallowed walls of Café Riche in Downtown, everyday we went to school with pen, paper, and microphone. Incredibly, the very three weeks that we were in town coincided with the reawakening of a movement, to finish what they had started back in 2011. For two outsiders eager to learn at any hour of the day It was nerve wracking, it was confusing, it was beautiful. One year later the loud voices of observers from all walks of life and all corners of the world would shout me down and say it was and has been a terrible year for Egypt, and we were witnessing just another chapter in a story filled with tragedy. While those voices might be louder and considered more credible than my own, I would still say to them – what I experienced in Egypt in the autumn of 2012 was a thing of tremendous beauty. I saw old and young walking arm in arm through the streets without fear, singing, chanting, smiling and inviting their neighbors to join them. I saw families camped out in the middle of this world famous square, sharing food, telling stories, and exchanging warm greetings. Every time we turned a corner we were greeted as welcomed visitors, people eager to show us and have us relay to the world – this is Egypt, we are glad you are here. When I think back on those wonderful weeks in Egypt, among so many great interviews worth listening to again and again, my favorite has to be Fouad and the boys, three friends sitting with us at an outdoor café in Downtown Cairo. Telling the story of what has been happening and Egypt and what it all means to them personally. Putting things in perspective, especially in that big-picture perspective of life, death, and everything in between. 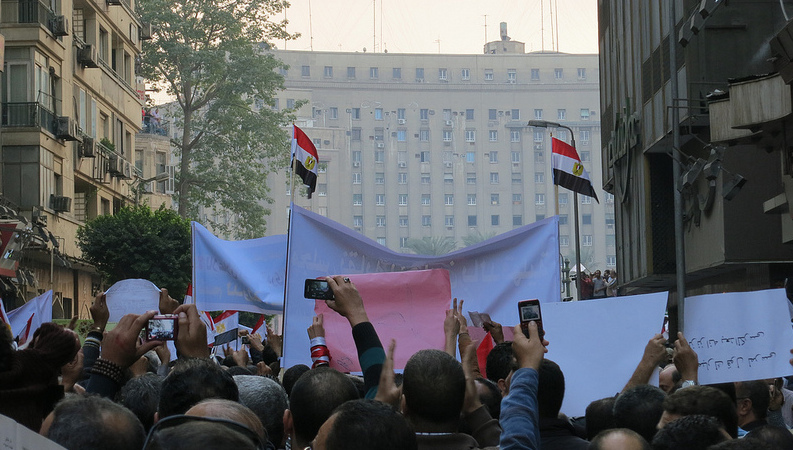 A lot has changed since those fateful days of November in Egypt. Lots more lives have been lost and terrible crimes have been committed. But anytime I see one of those simple conclusions in the press, or hear that blowhard at the bar spout off about how Egypt has jumped off the deep end, I remember what I experienced and the lessons I learned from some very special observers that live the reality everyday, including at this very moment. And I take solace in the fact that there is always more to this story, it isn’t all just one way, and oh the fantastic people you could meet if you were there right now. 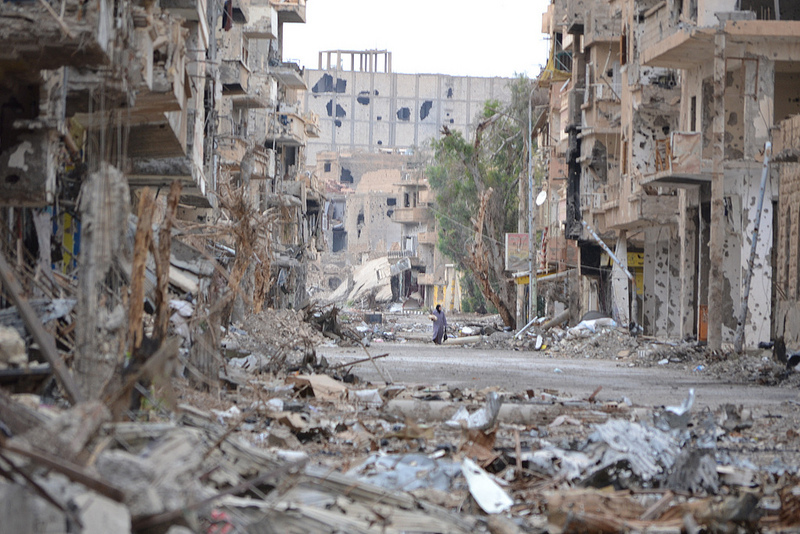 Deir ez-Zor in April 2013, photo credit Karam Jamal. In 2011 Ahmad and Karam, two university students from Deir ez-Zor took to the streets as part of the mass protest movement demanding an end to the regime of President Bashar Al-Assad. Their protest was met by violent reprisals, mass arrests, and soon war broke out and the government undertook a full siege of the city. 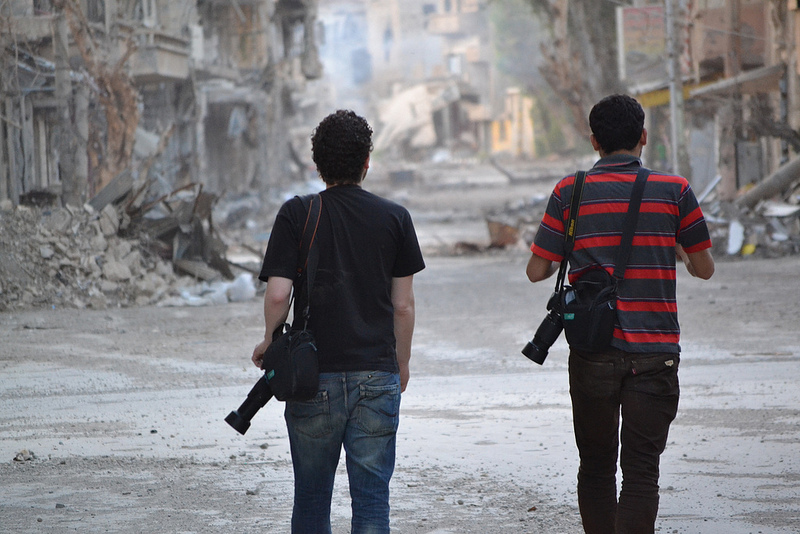 Since that time, these two friends have become a reporting team, collecting videos and still images as their families and their community have been decimated by war. Last month I had the pleasure of spending time with Ahmad and Karam in Turkey, as they briefly came over the border to participate in a media workshop. Over the course of several days, they explained in painful detail, the reality of life in Syria today. The tragedy, the struggle, and the absurdity of the war zone that their home has become. Despite grave danger and personal injuries they have already suffered, they two men remain dedicated to their mission as reporters with a message about their country, in the hope that people around the world are listening. If you wish to get in touch with either Ahmad and Karam, find them via those links or contact me directly. This week I find myself in the Northeast of the United States, home for the holidays and also to process all the audio, video, and photos from the Middle East – North Africa journey. Being back in the US means being subjected to the local and national media context, which makes American stories seem larger than life, and Egypt feel like another planet. At holiday gatherings and reunions with old friends I am often asked things like “So is it all falling apart in Egypt or what?” Sometimes its put in nicer terms, but the tone is most often one of skepticism and as if their minds have already been made up about what is happening in that part of the world. Images from Mohamed Mahmoud St., Tahrir Sq. In the American press I see the other standard reaction towards the events taking place in Egypt, including conclusions about what took place in the weeks that I was in Tahrir Square – the revolution has been hijacked, a new dictatorship has emerged, the opposition is falling apart. When I read and hear such analysis, by both intelligent and less well-informed individuals, I again feel like I left Egypt and landed on another planet. In this world everything has to fit into categories and boxes. There are either winners or losers. Things are either successes or failures. So whatever those countries are going through, they must fit into one of these easy to understand categories. What I wish most is that I could, even beyond my work here on the website and on radio open source, show them examples of the changes that have taken root on the personal level in Egypt and Tunisia. (and beyond I suspect) It never makes it into headlines or fancy mainstream news analysis, that metro workers went on strike last month, an action that would be unthinkable under the dictatorship. Women, long plagued by street harassment and oppression at home, are now organizing themselves to adopt tactics to neutralize such harassment and get out of abusive situations. Lower class people, long barred from ever working in higher skill and prestige jobs, are starting to demand equal opportunity and an end to prejudice based on what your father’s profession is. The list is actually much longer than this, but in my many conversations over the course of three weeks in Cairo, it was impossible to avoid stories of individuals carrying out personal rebellions against an old and oppressive tradition. Is the process complete and successful? Are the oppressed finally getting the justice they deserved? No. Sadly, these changes are slow to reach everyone and there is no guarantee that they will take hold for everyone everywhere. Is there resentment and push-back from those who don’t want to see these changes come to fruition? Yes. Many people fear what is to come and would prefer to keep things the way they were. But beyond all of this, no matter what happens in the future or what is happening now, something has changed in Egypt and that something is the individual mindset. And as so many people reminded us, over and over, once you reach this change and start thinking like a free person, there is no going back. In the early days of the 2011 revolt some young Egyptians found themselves at the beginning of their military service. While in Tahrir square and on the streets the winds of change blew away a dictator, in the barracks soldiers knew little of what was going on outside and what their fate might be as soldiers. Would they be deployed to the streets to confront ordinary citizens? Do they still answer to the same president or is there someone new? The questions were many and the information was scarce. In the lead up to and during those days in the military, Ahmed El Gendy wrote notes to himself and when the rare chance presented itself, on facebook. He wrote as he thought about his own life, his experience as a soldier, and how it relates to what is happening outside. And when he finally got out, his writings eventually became part of a theater piece, set along side letters from a political prisoner incarcerated during that same time period. Beyond the theater and since his military service, Ahmed has also become part of a small but growing group of young Egyptians involved in contemporary dance. Something that a few years prior was virtually non existent. Today we sit down with Ahmed El Gendy in a little garden high above Zamalek, Cairo, to talk about military service during the revolution, creating a theater piece based on that experience, and the evolution of his young career in contemporary dance.